It was Sunday, 24th March, 2013 and time was around 9:30 pm. I was about to retire to bed. At that time my wife Rajam called out for me from the computer room. Such calls mean she has encountered some unusual pop up message on the screen and wants to know what to do. But this time I was in for a shock when I saw the screen. 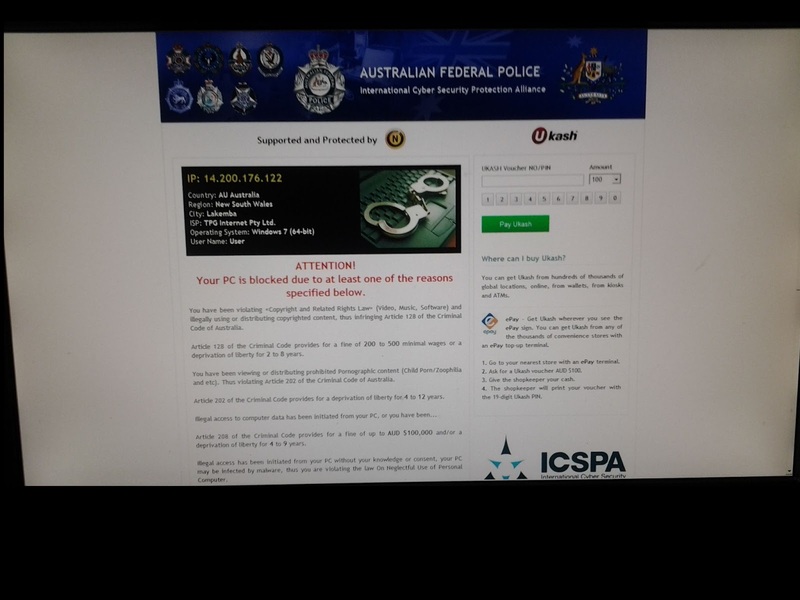 It carried a message from Australian Federal Police that my PC is blocked as I have been violating “Copyright and Related laws” (Video, Music, Software) and illegally distributing copyrighted content, infringing Article 128 of the Criminal code of Australia and that this provides for a fine of 2 to 5 hundred minimal wages or a deprivation of liberty for 2 to 8 years. It went on to list further offences and possible criminal code violations leading upto a fine of AUD $ 100,000 and/or deprivation of liberty upto 9 years. It further stated that my computer is locked and as this is the first instance a fine of AUD $100 is levied and that is to be remitted in the treasury through UKASH challan to get the computer unlocked. It also carried a warning that the computer will be under surveillance to see whether the offending material is removed from the computer. It also carried a Logo of ICSPA, International Cyber Security Protection Alliance and of INTERPOL. The notice also gave directions for purchase of Ukash challan. Rajam had for the first time been watching the programme of Iman Annachi in Thirai Video, where she usually watches Shivam, and so we concluded that it must be the new programme she was trying to watch that is the villain. We decided we will pay up the fine and then check up with the police the first thing in the morning. My daughter Suchie, who joined at this time felt I should contact the police first without paying any money, as they will not do anything like this without first issuing a warning and pointed out that even for speed cameras and surveillance videos, warning signs are posted. My son-in-law, Kumar, who was checking for me the local police station number for contact in his Laptop also looked into the Ukash as this was an unfamiliar term and then we came to know that what we have is a fake notice and it is really a ransomware. There was great relief all round and we closed the computer switching off the power and retired to bed planning to work out further strategy next day. Next morning I contacted the local police station and they said they have nothing to do with this warning and that I could have it fixed up either by ourselves or through a technician. Now the relief was complete. I took it to a technician who said it is the twentieth computer he is receiving in the past one week with this virus and that it needs initialising the drive and loading the operating system afresh. Luckily I had a week old backup and so gladly agreed to have the cleaning up operation done by him. 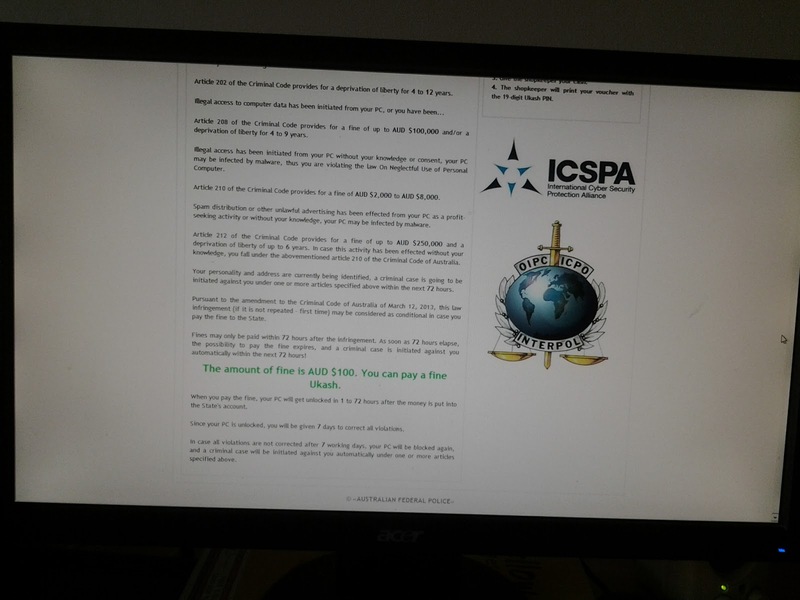 I wanted to share this experience with you all as this ransomware is a recent virus which is operated in different countries, with similar wordings but using the logo of the local police and demanding money in local currency like Euro or American dollars for unlocking the computer. Guidance is also available in internet for unblocking the screen and ridding the computer of the ransomware.